The PACC contest in 2015 has ended. For us it was another successful contest, again we improved our score. This year we claim 212.550 points. The band conditions were a bit lousy, but time by time nice DX was available. We worked ZL on the 15m band, using our new 15m 5/8 antenna, this is the furthest possible distance for PA stations. However, we did not work any stations in South-America or SE-Asia. Also the Caribbean stations were missing, they probably boycotted the PACC contest due to the fact that PJ2, PJ4, P40 and some other Dutch DXCC’s in the Caribbean still have no Dutch status according to the contest rules. This year Adrian PA0RDA used his brand new TS-590SG. 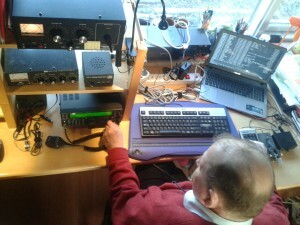 Last year the receiver of his TS-2000 was completely overdriven by the signals on 80 and 160m. The TS-590SG had no issues handling the strong signals on these bands, so this is a major improvement to the contest station. Improving our score gets a bigger issue each year. We are thinking on replacing our 10m antenna (simple J-pole), the 5/8 antennas on 15 and 20m work great, so maybe try this type on 10m as well? Also we still have plans to build a 80m vertical.